The Poesy Ring Collection is inspired by a 500-year-old idea that dates as far back as when knights gave their maidens rings with an inscription or "poesy" on the inside or out. Re-imagined to create a timeless and contemporary collection, each ring is designed to have a personal meaning and can be styled on different chains, worn as a singular statement, or a combined message composed of several rings. This poesy ring features an 18k yellow gold ring with a sterling silver ring lining, accompanied by a Silver Lining inscription. The Silver Lining poesy ring is to remind us that we can find something positive in every situation. This is the perfect piece to give a meaningful gift to inspire a friend, your family or even yourself. Shown on a contemporary 32" steel chain necklace that can be wrapped twice for a shorter option. 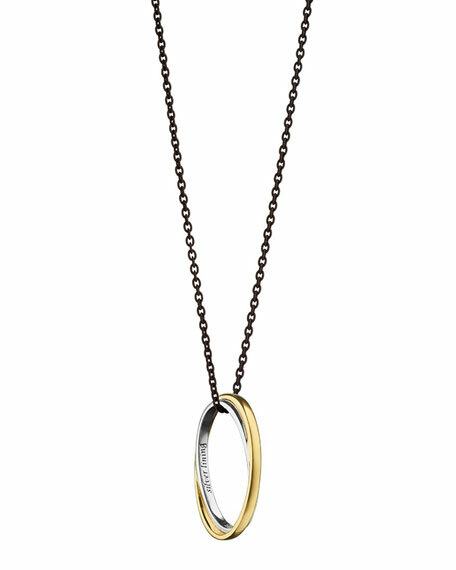 Monica Rich Kosann necklace from the Poesy Ring Collection. 18-karat yellow gold ring pendant with sterling silver lining. Engraved "Silver Lining" detail on band interior.